WHAT TO DO IN ELVA? SIGHTSEEING – Tule Elva! If you discover yourself in Elva and are blinded by the beauty of this small town, you can get help for orienting yourself from the Elva Hike Centre. You can find the Elva Hike Centre at the historical station building that also houses the tourist information office. The station building is a remarkable building in itself to view longer. The historical building, presently under heritage conservation, was built in 1889, and in 2008, it was reopened in its restored form. 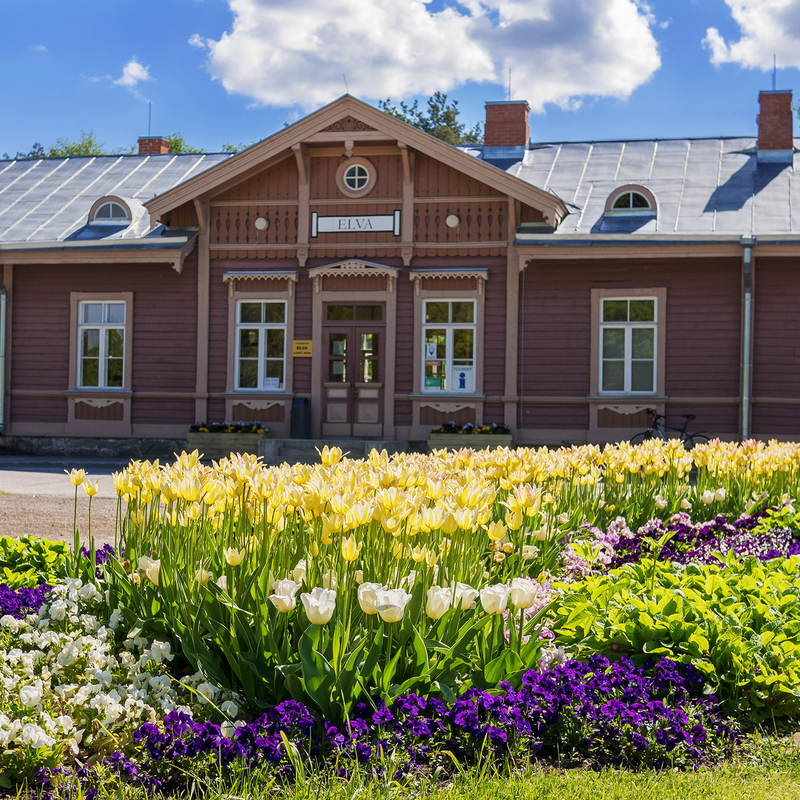 Residents of Elva love that beautiful building so much that in 2008, restauration of the station building was elected the accomplishment of the year in Elva! At the Hike Centre, you can buy mementos, find out about exciting events in Elva, have a cup of coffee, rest your feet, or see one of the exhibitions. Read more about the Hike Centre. You haven’t been to Elva, if you haven’t seen the Elva mushroom! Elva mushroom is a legendary former ice cream kiosk that was extremely popular with tourists in the 1960s. The kiosk is no longer active, but the mushroom is an obligatory sight for taking photos. The mushroom that has kept well over time got many little friends in 2013! Now, there is an entire small mushroom family in the forest, and is especially loved by children. But the locals love the mushroom kingdom as much – why else would they award the addition of little mushrooms with the title of the accomplishment of the year of 2013 in Elva! The mushroom kingdom is located in close vicinity of the Elva hospital on the Supelranna Street. Who is this gallant gentleman, whose bust proudly overlooks the surroundings on the green area on the corners of Kesk and Pargi streets? It is Hugo Raudsepp (1883–1952), a productive playwright, literary and theatre critic. Hugo mainly pursued comedy and satire, which even reflected in his humorous pseudonym “Milli Mallikas”. Although now, Hugo Raudsepp merely observes the life in Elva, his creation lives on. SEE OTHER EXCITING PLACES TO VISIT IN ELVA.